"I see a situation here where an honest man could make a dollar." After the success of 1969's witty Support Your Local Sheriff, director Burt Kennedy returns with much of the same cast for his 1971 follow up, Support Your Local Gunfighter, though rather than create a sequel, he sets out to create a similar comedic style with new characters. James Garner stars as Latigo Smith, a con man who we first meet en route to wed the owner of a dance hall saloon. Rolling in money, he bribes the cabin stewards to keep quiet about letting him off before they reach their final destination, and he winds up in the town of Purgatory, where one hell of a rivalry is going on. Harry Morgan returns, this time as Taylor Barton, owner of one of two mining operations tunneling their way under Purgatory in search of the mother load. He has word that a famous hit man has been hired by his rival, Colonel Ames (John Dehner) who has armed men blocking the Barton operation already. Barton's daughter Patience (Suzanne Pleshette), is a might riled that anything is going to get in her father's way, as without the riches of the gold strike, she is never going to make her way to a school for girls in New York. She is also pretty hot headed and decides to shoot up the town after one of the locals makes a passing remark to her. When they see Smith get off the midnight train, the Bartons assume he is the assassin, Swifty Morgan, and the fun begins. Smith meanwhile, needing to get something off his chest,is in search of the local medic (Dub Taylor), when he meets up with the down on his luck cowpoke, Jug May (Jack Elam). After the unfortuitous loss of his poke, Smith sets out to con the local bar maiden, and then sees a golden opportunity to reclaim his fortune when he is approached by Barton, who proposes a counter offer to win the man over to his family's cause, still under the mistaken assumption that Smith is a killer. Latigo gets the slow witted May involved in the ruse, and soon the two are back in the money, but when Colonel Ames finds out what has been going on, things will get a lot worse before they get better. They don't call it Purgatory for nothin'! 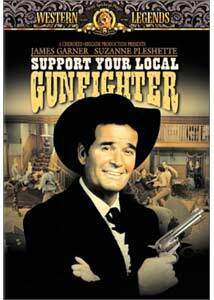 While Support Your Local Gunfighter has its moments, it is still a notch or two below the original. The cast again turn out decent performances, and the return of players such as Henry Jones and Willis Bouchey add a touch of familarity to the picture. Pleshette makes a good femme fatale, who, not unexpectedly, eventually warms to Garner's character, and Jack Elam steals the show again. As Garner's character gets himself in and out of jams with amazing frequency, the complexity of the town's social order also gets treatment, with Ellen Corby (The Waltons) making an appearance as both Colonel Ames' sister and Taylor Barton's love interest. Support Your Local Gunfighter still gets a recommendation, but more as a companion piece to the original than on its own merits. Image Transfer Review: Inconsistent with the first film in this series, MGM has presented Support Your Local Gunfighter in a 1.85:1 nonanamorphic transfer. Despite this, the image holds up fairly well, save for the loss of resolution and inherent line structure when viewed on widescreen sets. Colors are well rendered if a bit muted, and the source print is clean for the most part, with only a few spots and specs marring the image on occasion. Black levels are decent, and no sign of edge enhancement is evident. I do wish MGM would commit to anamorphic across the board, as this could have looked better. Audio Transfer Review: Audio is two channel mono, which is a bit low in level, but otherwise fine. Dialogue is clear and undistorted, and the sounstrack is well rendered if not covering the full frequency spectrum. A Spanish track is also included. If you enjoyed the western spoofing of Support Your Local Sheriff, its sequel makes a good companion piece. Garner is true to form, and his supporting cast give fine performances, though the scripting isn't up to the original. Still, it is an highly enjoyable adventure, peopled with some of the western's comedic best.